The developers of Osmos, Hemisphere Games have finally revealed the GNU/Linux sales in detail, while there are no hard numbers, sales percentage is still an indicator. So enjoy the good read and support the indies ! Jun 23rd, 2010 by eddybox. t took Dave six weeks to do the port, including time spent testing across multiple flavours of Linux, and running the beta from start to end. Personally, I’m really impressed with what a solid job he did, and how quickly he did it. I doubt an experienced Linux programmer could have done it much faster, especially since Dave was already intimately familiar with the codebase. In fact, it’s hard to imagine porting any game to Linux much more quickly. (Excluding games built in Flash and engines that already support it of course.) The code was engineered to be cross-platform from the start, built on libraries like OpenGL, OpenAL, libogg/libvorbis, freetype, etc. In addition, Aaron had already done a great job on the Mac port, ironing out any remaining gcc/abstraction details. All this to say that Osmos was primed and ready for Linux-porting, and all work done on that front was specific to Linux. We spent an additional week or two on miscellaneous tasks, including some additions to our e-commerce/delivery system, support, community, PR time, etc. So… let’s call it an even 2 man-months across the board for our studio. A big question is, what’s a man-month worth? All I can say is, if your answer is the industry consulting standard of $10k/month — you’ve way overbid, and put the Linux port of Osmos into the financial-loss category. However, as independent developers with a passion for what we do, our goals and desires are considerably lower than that (i.e. less than half). Unfortunately, this isn’t so simple for us to measure. We’re selling Osmos under a pay-once-for-all-platforms philosophy — for $10 you get the Windows, Mac and Linux versions. So the numbers are fuzzy. What we can determine though, is how many times each person downloaded each version. We can also look at our sales graph over time, where there is a clear and obvious spike associated with the release on each platform. On first glance, one very cool stat emerges: our best sales day ever (by 29%) was right after the Linux release, similar to what 2dboy experienced with World of Goo. That said, the spike is also somewhat narrower than what it was for the Windows or Mac releases. In any case, if we measure the area above the “background noise” for the Linux release (based on the previous month’s sales), this gives us a conservative lower bound on sales. I say lower bound for several reasons. 1) As many Linux folk have pointed out, some purchased Osmos prior to the Linux release in support of our studio and on the promise that we would deliver the port. 2) There may still be some Linux mini-spikes to come, and future “background noise” will of course include Linux customers. That said, based solely on these numbers, Linux accounts for roughly 15% of our sales to date. We can also determine an upper bound based on client downloads. Here we see that 21% of all our customers have at least clicked on the Linux download link. You may notice that the percentages add up to more than 100; this is because customers can download on multiple platforms. In any case, it’s safe to call this an optimistic upper bound, as I know for a fact that some customers click on every download link just to test it out. Also, it’s impossible to know if some of those people would have made the purchase based solely on the Linux version. 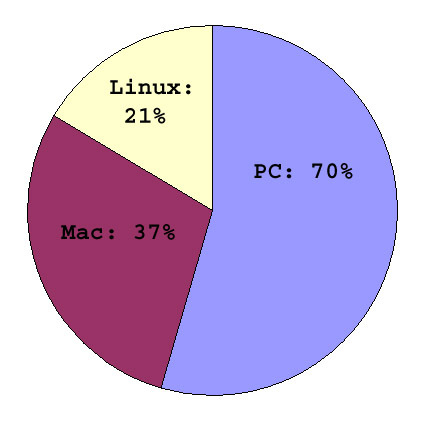 So as a bottom line, Linux accounts for between 15% and 21% of our sales, with the “real” number being somewhere in between. When we say “yes, it was worth porting Osmos to Linux”, we’re basing it on the lower bound. If the reality is closer to the upper bound: that’s “gravy”. The tail: more gravy. (Though it does cost us time and money to support and maintain the site). As any Linux user or developer knows, there’s more than one way to skin a distribution on Linux. 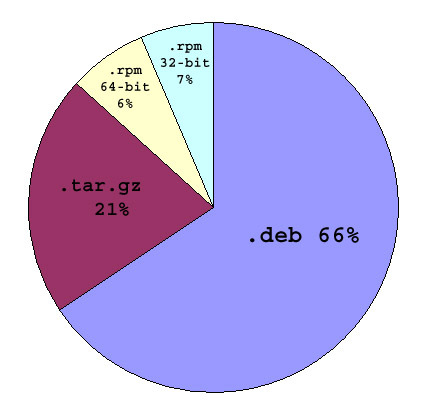 Dave created four different packages: .deb, .tar.gz, a 32-bit .rpm, and a 64-bit .rpm. Here are download stats by distro. 14. and a special mention goes out to Liam Dawe of gamingonlinux.info, who helped spread the word to a number of those sites! While we expected/hoped to see traffic from sites like linuxgames and happypenguin, we were very surprised to see the amount of interest from Russia and Eastern Europe. Apparently Linux gaming is alive and strong in that part of the world! People are interested in numbers, and we’ve provided them, but that’s just one dimension of the story. As independent developers, there are other more altruistic factors that are important to us. Before I go on, I must admit that I’m spoiled. Dave did all the hard work on this port, and all I did was some website work: extending our digital delivery system, etc. So I’ve experienced nothing but the happy glow of the release, and from my perspective the Linux community has been awesome and generous. We’ve received a heap of positive and encouraging feedback, which is always nice to hear. Support emails for Linux are night-and-day-different from Windows or Mac — they include the log, version numbers, stack info, troubleshooting schemes already attempted, etc. Sometimes they even include the solution to the problem — just letting us know. And Linux users are vocal — there have been some amazing people in the community that have helped spread the word. We simply could not have done this ourselves; we wouldn’t have known half the places to approach, and even if we had we would have come across as fish-out-of-water. So once again, thank you. That’s it for now on sales. We’ll probably follow up with some additional stats on the Linux tail in a month or two; but in the meantime, if you have any questions or comments, fire away! those are interesting numbers. Could you skip the rpm? not sure, my distribution is rpm bases so its an extra intensive for me to buy. Although most games I get are in a tar.gz with small installer and that if fine too. If you where to use the Opensuse buildservice you should be able to make rpm’s and deb’s without much extra work ? All in all glad it has been a success for you. I always download the tar.gz version if available, or other kind of unified installation (like .bin for example). While my current distribution is .deb based, if one day I’ll move to .rpm or source based distro – I would want my games to work, extract and run, or execute the bin and install. And making the extra links in the start menu is not a problem. When I won the contest here at LGN I grabbed the 32 bit RPM for my Fedora machine, but if they feel it necessary I would be perfectly able to just grab a Tarball instead. For convenience sake I would prefer them to keep building RPM packages though.